They say all stories have teaching moments. The following is a story from my childhood. Although as you’ll see it made some immediate difference in my life, it took me another 40 years to understand and appreciate the learning. As a boy growing up in Calgary, Alberta, every summer my parents would take my two younger brothers and me on a road trip to visit our grand-parents, who lived in small, towns in southern Saskatchewan. Although my brothers and I completely enjoyed ourselves once we’d reached our destination, the eight-hour car drive that it took to get there seemed endless to us. The terrain was flat and covered with monochromatic fields of grain. The first part of the trip was on a paved two-lane road, which later gave way to a dusty, one and one-half lane, gravel road, paralleled by an infinite line of telephone poles and railroad tracks. Tracks which inexplicably never seemed to have any train traffic. Every once in a while the road would be punctuated by a rural intersection around which a couple of buildings, a gas station and most prominently, a grain elevator were huddled together for apparent companionship. My Mom and Dad were in the front seat along with one of us boys. For my brothers and I, the front seat position was of course prized because there was more to see and a reduced likelihood of being carsick. At each rest stop, we’d rotate the front seat opportunity. The two left in the back, either sat on the seat looking out the window in a vain attempt to see anything interesting, or lay on the floorboard somehow conforming their body to accommodate the drive shaft hump. During the trip, one after the other of us boys would call out, “Are we there yet?” followed seemingly, only moments later with a repeat of the same question, but with more whining. This pattern continued, progressively eroding my Dads patience until he reached his annoyance threshold, at which point he would curtly say “don’t ask me again, I’ll tell you when we get there.” That of course would extend the interval between the whiny question cycles, but it didn’t stop us completely. During one trip however, having once again reached his limit, my Dad said, “Why don’t you count grain elevators?” He’d already tried having us count telephone poles, but that was too boring. Now, I don’t know about my brothers, but looking back on it, this grain elevator counting thing turned into something of an epiphany and an important learning experience for me. 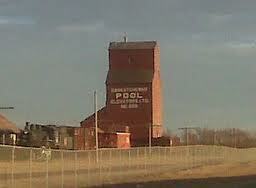 I’ll insert here, a brief sidebar for those of you unfamiliar with grain elevators. They’re large, multi-story structures located adjacent to main rural roads and train stops. They’re typically painted rusty-brown, red or white and they’re emblazoned with the name of the grain company, or co-op, and the name of the small town or village which was clustered around them. They serve as collection points for the harvested grain from all of the surrounding farms, and as loading points for large trucks or trains that would take the grain to the big city processing centers. On the flat prairie they’re really the only vertical landmarks and they’re as iconic to the towns they anchor as the buildings that produce the skylines of New York and Chicago. So, with my Dads prompt, I started, somewhat unenthusiastically, paying attention to these grain elevators with their tall, angular shapes, limited color palette and obscure names. After a while though, this grain elevator focus started to grow on me and I realized time was passing more easily. After doing this for a couple of summer trips, I started to recognize and remember, the individual grain elevators, the towns they represented and the sequence in which they appeared during the trip. This gathering of grain elevator visual cues not only gave me a sense of trip progress but strangely enough gave me a feeling of a kind of empowerment over the situation. I was no longer semi-conscious, anxious cargo, I felt like I was part of a transportation project. My brain neurons had constructed a mental map of the trip and I could now realistically envision the coming end-point and had gained some feeling of control over my environment. I never asked the “are we there yet,” question again. So what’s the teaching moment? It may not seem like much I suppose, but for me it’s like de-coding the whole learning process mystery. It’s about understanding how our brains develop from childhood to adulthood and how we can be further develop them to become to become adults 1.0 and 2.0 so to speak. Our lives are constantly bringing us subtle learning opportunities like these, and we need to pay attention to, and leverage them. We must learn to take the raw data from our senses and apply context that will turn it into information. Information, that with meaningful application can become knowledge. Knowledge re-wires and matures our brains, giving us mental maps of the way the world works. These maps enable us to predict future outcomes, based on our past experience and real-time sensory input. This capability reduces uncertainty and our anxiety over it, and gives us confidence, hope and clarity to make good decisions and allow us to feel like we have some control our lives. This entry was posted in Humor, Personal Development, That's Life and tagged brain development, cognitve development, humor, learning. Bookmark the permalink. Well written. This was an enjoyable and refreshing memory jogger. I would suggest that living is a constant learning/evolving process and whether we pay attention to the events or not, our brain continues to re-write the knowledge code. I think the important point is to recognize significant changes and record the learning points for others to accelerate their learning/evolving process. I would have to disagree with you, to a certain extent. For those who have achieved something in their life, constant learning/evolving process (Personal growth /self-improvement) comes at a rate commensurate with their efforts to improve. This also is linked to the level at which they have achieved. Success at any activity or endeavor, only comes with efforts to change and get better at that activity. Thus, the folks who have succeeded in their life have practiced change, commensurate with their level of success. If they read self help books, attend seminars, and take an introspective look at themselves when faced with criticism, they will continue to have personal growth at a high rate. However, with decreased efforts, there are decreased results. We need to accept that there are people, who still take no ownership for their actions or relationships, and believe that they are victims. They are victims of their Race, The Assault, Their Parent’s, The Disease, The Accident and so on. Until these people accept ownership for their actions, and believe that they, at least, have input into the events that affect them. They will never change and remain stagnant in their emotional and societal growth. My training backed by my experience, says that change is driven by seeking to alter the outcome of a negative event in your life. This negative event, can range from something as innocent as boredom on a trip, to as significant as deciding to be free from drugs. It also strikes me that self-improvement can only occur, when people have the critical thinking skills to be able to process the link(s) between cause and affect. For example there are some family friends of the family, where the mother of the family micro-manages everything that her children do. These kids have made no decisions in their lives and therefore have no practice at making any decisions. They are incapable of personal growth in any area other than scholastically. Which given time, as you pointed out and I agree with, personal growth can grow from that foundation. But the deficit in decisions regarding everything else, can either lead to a permanent blind spot about their ability to make decisions, or personal destruction from making a bad decision of self destructive magnitude before any chance of feedback. These kids and others like them need to be given the “Gift of Responsibility” and allowed to fail at things when young. It is a constant issue for us as parents, to balance making it better for our children and stripping them of any negative feedback from their actions. Our love for our children causes us to try to keep them from harm and as a subset of that, pain. However, that pain, makes a personally negative situation for the child, and when properly guided, can generate personal growth. The price is so much cheaper when lessons are learned at a young age. For example, teaching honesty at a young age make involve loosing desert, or a grounding. But learning the same lesson as an adult could involve jail time. The application of this phrase will help people realize their role in solving the issue at hand. It will also, provide a foundation for teaching the critical thinking skills necessary for solving problem. When everyone around us is solving problems and taking responsibility, then everyone will also start having the constant learning/evolving process that you mentioned earlier. A form of reply is that since we dont really know what “fix it” means, outside of a technical process, at least as far as that obscure concept of self realization goes, the real practical question is “how can I make a difference”. That can be subtle and you may not get a Grammy for it. Think how challenging it is for us above average guys. Imagine how challenging it must be for the average people of this world or for those born into circumstances that make even survival a question. Pete, I think you went way beyond what I was attempting to capture as a thought from Don’s article. I thought that Don was showing that we continue to learn and evolve, and from that learning, we are able to understand earlier experiences and data differently from when they occurred. In an attempt to connect with an earlier article from Don on Project Management, I suggested his point really was that we need to record those significant learning experiences for others in Project Management. I would agree with you from your examples that there are different life experiences for everyone based on a wide variety of situations and circumstances. I certainly am not qualified to debate the effects of childhood training and experiences on an individual’s ability to learn and evolve as an adult. I can only say that I definitely have substantially changed my approach and opinions in living from 10 years ago, as an example, and some of those changes were not from a structured learning curriculum. That is the difference between you and I. While you were doing something constructive, I was probably refining my ability to torment Doug. As far as constructing a knowledge base from environmental data, the brain is only capable of creating a representation of “outthere” that fits our agenda. It’s not reality per se but one that works given what we think we want to do on that playing field. We are trying to avoid ending up on a soccer pitch in our hockey gear. I saw a bumper sticker once that read, ” I’m not looking for reality, I want an illusion that works”. Rod, one of your brothers. Rod, You’re right about this highlighting the differences between us. I was always locked up in my head, and you were out there interacting with others, even if was is the form of tormenting Doug. Who knows what mind maps and life skills you developed doing that. I’m sure I didn’t realize what was happening at the time, other than that I was less bored. It’s only the subsequent 40 years or so of additional life context that allows me to See it as a learning moment. Also, I’m pretty sure that Dad wasn’t thinking of it as a teaching moment at the time. It just goes to show you how some of the most innocuous things we do an have a profound impact on our kids. Speaking of kids, I hope Kelsey didn’t hurt her ankle too badly and will be up and around soon.